There have been a lot of introductions recently. As you pointed out in your opening USC press conference, not too many of us had heard of your school, much less yourself, before the NCAA Tournament. At the same time, you have to quickly become acquainted with your new players. Watching tape rarely tells the entire story, especially at USC, where a midseason coaching change caused a mishmash of playing styles and rotations. No need to worry. We at Galen Central are here to help. Below please find an introduction to your new returning roster (in order of 2012-2013 scoring average). J.T. Terrell (11.7 ppg) Terrell’s polarizing playing style elicited several distinct responses. “No, no, yes!” might have been heard coming from the student section after Terrell pulled up and made a deep three-pointer in transition. “No, no, $%@& no!” could have been thought by former coach Kevin O’Neill as Terrell’s shot selection buried him deeper and deeper into O’Neill’s dog house. “Yes, yes, yes!” seemed to be interim coach Bob Cantu’s mindset as he gave Terrell the freedom to display his offensive talents. You are going to like Terrell. He is unquestionably a talented three-point shooter. Terrell finished third in the Pac-12 with an average of 2.2 three-point field goals made per game, and often fired up the crowd with his trademark “three-point goggles” hand motion. At the same time, he never saw a shot he did not like. Terrell incredibly attempted 6.0 shots from beyond the arc, and finished outside of the top-15 of the Pac-12 for three-point field goal percentage. Terrell really shined after the coaching change. He averaged 8.7 points under O’Neill, and 14.3 under Cantu. Byron Wesley (10.2 ppg) You know what you will get from Wesley. He is a consistent scorer who is often tasked with guarding the opponent’s best perimeter player. As a freshman, the knock on Wesley was that even though he could get to the basket, he could not shoot. He therefore worked hard over the offseason, and as a sophomore, improved his three-point shooting percentage from .111 to .397, and his free throw accuracy from .517 to .725. It could not hurt to give him one of your instructional shooting DVDs to help him get to the next level this offseason. Omar Oraby (6.3 ppg) Your two biggest players at FGCU were both 6’10”. They only weighed 217 and 180 pounds, respectively. Meet Omar Oraby. All 7-foot-2, 270-pounds of him. As you can imagine, Oraby attracts significant attention. You need to figure out how to properly utilize Oraby. The big man started (16 points on 5-of-6 shooting) and ended the season (18 points on 8-of-11 shooting) with big games. In between, however, Oraby only reached double figures in scoring four other times. The problem was the Trojans failed to give Oraby enough touches. He shot .609 from the field, but did not attempt more than 10 shots in a game until the Pac-12 Tournament, when he had to play a season-high 35 minutes with Dewayne Dedmon and James Blasczyk suspended. Oraby also has to accept part of the blame as well. He needs to stay out of foul trouble, and get into better physical shape, to play more minutes. 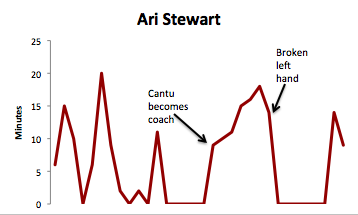 Ari Stewart (3.4 ppg) It could be dizzying to look at Stewart’s game-by-game minute log. Stewart was an enigma during O’Neill’s tenure. In the one game Stewart played 20 or more minutes, against San Diego State in late November, he made three three-pointers. During the next five games, however, Stewart only played a total of 13 minutes. Stewart did not appear in O’Neill’s final five games. He became a regular part of the rotation with Cantu at the helm, but missed six Pac-12 contests with a broken left hand. As an athletic wing player, Stewart will fit perfectly into your system. Last year it took Stewart 22 games to attempt his first free throws, but he made them count. 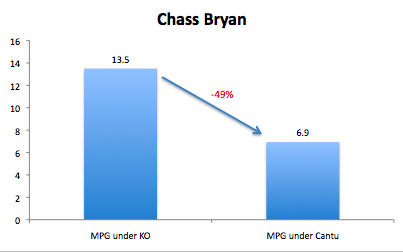 Chass Bryan (1.8 ppg) 5-foot-9, 165-pounds. Presidential merit scholarship recipient. I know what you are thinking–sounds like a description of a Galen Central writer, rather than a valuable contributor to the team. Despite his physical limitations, Bryan earned the back-up point guard role. Do not let his statistics (1.8 ppg, 1.29 apg) fool you; when Maurice Jones was declared academically ineligible before the start of the season, the Trojans desperately needed a backup point guard, and Bryan provided quality minutes. 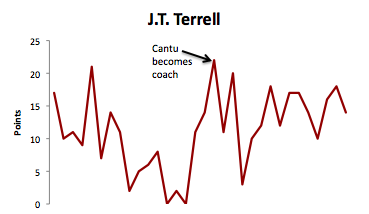 Bryan’s playing time fell significantly when Cantu assumed the head coaching position, likely because the Trojans were deep into Pac-12 competition and needed to rely more on Fontan. With Fontan, who played 33 minutes per game, departing, you might be playing Bryan even more this season. He will have to compete against incoming guards Julian Jacobs and Kahlil Dukes. Brendyn Taylor (.7 ppg) The Trojans have not had a reliable defensive stopper since Marcus Simmons won the Pac-10 Defensive Player of the Year award in 2011. Taylor is the best hope among returning players to step into that role. Taylor has the size—he is 6-foot-2, 185-pounds with long arms. He has athleticism—he unleashed spectacular dunks in practice. 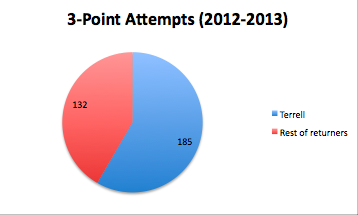 However, like Simmons, Taylor is going to need to improve his offensive game to get onto the floor. In a small sample size, Taylor never established himself as an offensive threat. He will need to improve his shot this summer to earn a spot in the rotation. Strahinja Gavrilovic (.3 ppg) Kevin O’Neill famously nicknamed Gavrilovic “Luis” because Strahinja was too difficult to pronounce. Naturally. By whatever name you call him, Gavrilovic did not have much of an opportunity to contribute as a freshman. He averaged less than two minutes a game in six appearances, making one basket. In practice, Gavrilovic displayed an aggressive, hard-nosed style, and noticeably put on muscle over the course of the season. The departure of forwards Aaron Fuller and Eric Wise opens playing time. Daniel Munoz (0 ppg) Munoz burst onto the scene during the 2011-2012 season. After playing a total of only five minutes his first two years in Cardinal and Gold, the walk-on received an opportunity to play significant minutes down the stretch. With the Trojans ravaged by injuries, Munoz appeared in 10 of USC’s final 12 games, including a start. This past season, with Fontan healthy and Bryan playing well as the backup point guard, Munoz returned to the bench. He appeared in three games for a total of three minutes of garbage time. As a fifth-year senior, Munoz will be your longest-tenured Trojan. Zach Banner (DNP) His nickname is the Hulk, and at 6-foot-9, 335-pounds, you can surely guess why. Banner’s first priority is football, where he is an imposing offensive lineman for the Trojans. Banner did not see action on the court last year, as a result of missing practices for football, as well as being in football shape, which prioritizes quick bursts of energy over endurance. It is difficult to envision Banner playing a large role in your up-tempo system, especially if Dedmon and Oraby return. Banner could certainly provide depth in the post, however, if the starters get into foul trouble. We hope this analysis helps as you prepare for your new role at USC. If you have any further questions, please feel free to ask us over coffee at Starbucks. Or we could even go to Taco Bell if you prefer. We are not picky.